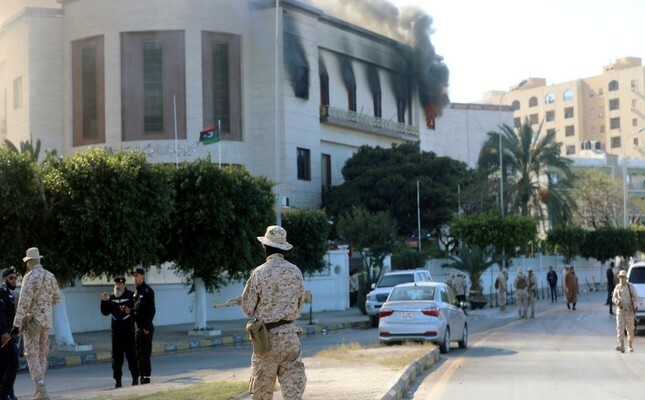 Security forces stand around the headquarters of Libya’s Foreign Ministry after a suicide attack, Tripoli, Dec. 25, 2018. Libya is living in worried anticipation of whether clashes will renew as forces loyal to Gen. Khalifa Haftar made a recent move in the country's south with the claim of protecting the oil fields and combating Daesh extremists. At least five people were killed in new fighting between rival militias on Wednesday. According to the first statement of the Ministry of Health in Tripoli, five people were killed, and 20 others wounded in these clashes. The fighting resumed despite a warning from the U.N. mission in Libya that warned of any violation of the September truce agreement. Between late August and early September, fighting between armed groups from other western Libyan cities and Tripoli militias left at least 117 people dead and more than 400 wounded. The violence stopped after the cease-fire. But a militia from the town of Tarhouna, called the "7th Brigade," has held its positions. On its Facebook page, the Tarhouna or Tripoli Protection Force, an alliance of the main Tripoli militias, said it intended to "repel the attack of the attacking groups" because the latter "failed to respect their commitment to withdraw outside the borders of the military zone of Tripoli." The rival militias are engaged in a struggle of influence for the capital and control the major institutions and wealth of the country, which plunged into chaos since the ouster of former President Muammar Gaddafi in 2011. The militias in Tripoli claim to be loyal to the national unity government in Tripoli but the government's authority over the militias seems to be limited. The spokesman of the army of the unrecognized Haftar administration, Ahmed Al-Mismari said the order came from Haftar for "securing and protecting the residents from terrorists and criminal groups." "The operation is going to protect the people from the terrorists and criminals who work for foreign parties to change the topography of Libya and its identity," his statement read. The clashes are worrying as the country aims to agree on a constitution through organizing a referendum as soon as possible. Following the referendum, elections are planned. These attempts aim to erase the division within the country and unify warring groups under a parliament and a government. The U.N. hopes that Libya will hold its national elections in June after the organization of a referendum on a constitutional framework. The Libyan High National Electoral Commission said last month that it could hold a referendum in February if the U.N. backs and supports them.